Lucky Witch (Slot Game) was released in October 2011 by Microgaming. This Halloween based slot game has 5 reels and 15 paylines. RTP (Return to Player): 96.40%. The coin size varies in the denominations of 0.01 up to 0.20, and wager 1 up to 20 coins per pay line bet. The minimum bet amount is 0.01 and the maximum bet amount is 60.00 per spin. The maximum payout of the game is 15,000 coins per line bet. The Lucky Witch Logo symbol in the game is a wild multiplier symbol. It acts as a substitute for other symbols to complete winning combinations and multiplies the payout by 2x. The Lucky Witch Logo wild symbol does not substitute for the Potion symbol or to activate the Free Spin Bonus Round game and also does not substitute for the Cauldron symbol to complete winning scatter combinations or to activate the Mystery Bonus Feature games. 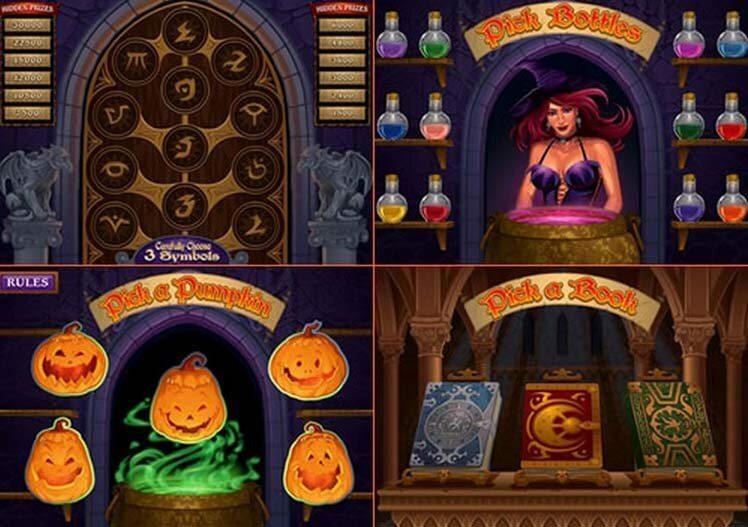 The Cauldron symbol, and the Potion symbol in the Lucky Witch slot machine game are scatter symbols. The Potion scatter symbol can be scattered anywhere on the five reels to complete winning combinations, provided two or more Potion scatter symbols appear. Three or more Potion scatter symbols scattered anywhere on the five reels activates the Free Spin Bonus Round game. The Cauldron scatter symbol only appear on reels 1, 3, and 5. The Mystery Bonus Feature is triggered when the Cauldron scatter symbols appear anywhere on reels 1, 3, and 5 simultaneously. Three or more potion scatter symbols activate this feature. Player is awarded 13 free spins. The feature can be re-triggered during the free spin round. The Mystery Bonus Feature is triggered when the Cauldron scatter symbols appear anywhere on reels 1, 3, and 5 simultaneously.